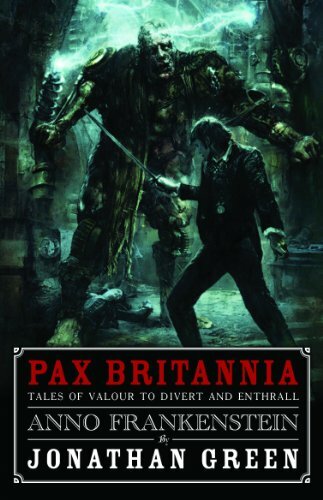 Anno Frankenstein by Jonathan Green is the seventh book in the Pax Britannia alternate-reality series featuring Ulysses Quicksilver, agent of the Crown. This book has us traveling back in time to 1943 when Magna Britannia has entered the war against Hitler’s Germany. Our hero is to infiltrate Germany with the assistance of Dr Jekyll, and not to return until maximum destruction has been caused. On the way, we meet a Russian vampire, a German werewolf, regiments of dead soldiers reanimated in Castle Frankenstein, and troves of other supernatural and horror characters. This is all terrific fun, and truth be told, even more amusing if you know a little history and have a geeky interest in horror and supernatural literature. There are many references to characters and creatures, both real and fictional, and it’s blended together with some equally fascinating steampunk. Anno Frankenstein starts off at high speed and accelerates as we approach dead man’s bend. If you enjoy a white-knuckle ride and laugh in the face of danger, this is the book for you. You can read the original review here, and buy your copy of Anno Frankenstein here. Happy Birthday, Isambard Kingdom... BRUNEL!